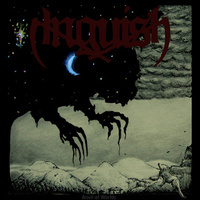 Brand new two-song split from fellow Swedish doomsters, Anguish and Below. Many of you know Anguish from their tremendous debut on Dark Descent from 2012, "Through the Archdemon's Head." They return with their bleak and harrowing style of doom metal on this split with a brand new six and a half minute track. Below are newcomers and this is their debut release. They also crank out a track over six and a half minutes but their style is more epic with soaring clean vocals over killer traditional doom riffs.